The 2,940-acre state wildlife area has been offering them a winter home since 1969. Elk are provided a supplementary diet by the state fish and wildlife service, so it gives them incentive to stick around until things green up in the spring. 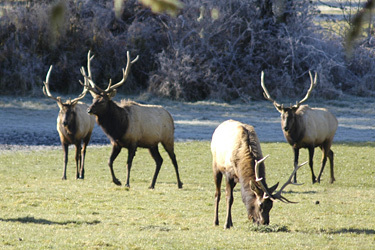 The area is off limits to hunters, so the elk are safe from human intrusion. The herd can usually be seen from a designated viewpoint, or from inside your car when parked along Oregon 202, a backcountry road that connects U.S. 26 to Astoria.